President-elect Donald Trump has aimed his crosshairs at General Motors after extensively criticizing Ford for most of the hard-fought 2016 presidential campaign season. General Motors is sending Mexican made model of Chevy Cruze to U.S. car dealers-tax free across border. Make in U.S.A. or pay big border tax! Trump is referring to the 2017 Chevrolet Cruze hatchback, which is built in Mexico for global export, including the United States. General Motors builds the Cruze sedan at the Lordstown, Ohio assembly plant. In 2014, GM promised a $350 million into the Ramos Arizpe plant in Mexico for Cruze production but has remained quiet on additional investments in the country, specifically in amounts and for which vehicles would be produced in the country. Right now, there’s no consequence. They take their factory, they leave, they fire everybody in Michigan … and after they fire everybody, they build cars in a different country and they just sell them to us and there’s no retribution, there’s no consequence that will stop them from leaving. Running parallel to the criticism is GM CEO Mary Barra’s appointment to Trump’s economic advisory panel. She will provide insight from the private sector for the President-elect. GM invested billions into U.S. manufacturing in 2015 but has made shift cuts amid a shifting market from passenger cars to crossover vehicles. GM will shut five U.S. plants down for two weeks this month to help curb passenger car inventory. The proceeds of this “border tax” (meaning, what, an importation tax or tariff?) … so where would that money go? Towards assisting creating more factories and jobs in the US? Offsetting, say, China’s 35% import tariff? I guess that’s the part of the “border tax” that’s missing – where would that money go? To incentivize things for US job creators? Seems like a lot of the president-elect’s statements aren’t very transparent re: a) We’re gonna do this, because b) it’ll allow us to use the funds to accomplish (answer goes here). Beyond punitive punishment. Maybe Mr Trump is thinking 1/2/3 steps ahead. I would hope so. I was attempting to give him the benefit of the doubt. Okay, we know you are a sore loser, and like many in the mouthy minority who spew their scare-mongering propaganda against anything that doesnt toe their left-wing view of the world…you lost, move on, do something productive besides attack everything President-elect Trump says or does (or doesn’t even do), and just get over it. You tried every trick and scare tactic in the book to stop Trump and it failed…Just like Brexit. For the not-so-Silent majority, we couldn’t be more happy that someone is actually standing up for the common and actually protecting Americans once again… President-elect Trump is not even in office yet and the stock market is at record levels, the dollar has strengthened considerably, consumer and business confidence at 15-year highs, and Ford and GM moving production back to the U.S. and billions in investments announced because Donald J. Trump was elected President. 2017 is going to be an awesome year…unless you are a left-winger. Donald Trump needs to remember before his threats have any teeth, Trump would need to repeal NAFTA and even then factories already in Mexico may be grandfathered in; thus, Trump needs to seek advice from his legal team or risk a lawsuit against him by General Motors for slander. Actually he changed production when he was called out on it a couple of years ago. Hitlery Clinton will never ever be President of the United States of America. That singular thought makes me wake every morning with a big smile on my face and ready to work hard for my fellow Americans. Stay tuned… Wikileaks just announced it has some huge surprises in store for us this year about more corruption involving the Democratics and Hitlery Clinton. Check their Twitter feed as they are already posting some interesting things. I don’t understand, what’s the difference between Mexico on one hand and Canada/Australia on the other, Don? He claims that the vehicles GM is importing from Mexico are not being taxed. His comment is pretty straight forward. And vehicles from Australia and Canada ARE being taxed? Even though Canada and Mexico are in the same NAFTA together. Even though US and Australia have an equivalent called the USA-Australian FTA. Are you sure, and in particular, do you have the reg number or tax law number? The difference are labour rates across countries. It’s expensive to manufacture in Canada and Australia (in fact, the Chevrolet SS will be axed soon because GM Australia is shutting down its SA plant). FTAs are designed to put countries on a ‘level playing field’ and eliminate disparities that could deem a country uncompetitive but Mexico has a favourable labour and regulatory environment without the FTA. Canada and Australia are like another state of the US. Canada may not like to admit that, just like New Zealand does not like to admit that it is another state of Australia. I looked these countries up, and I found the largest difference between Mexico on one hand and Canada/Australia on the other … There are more Christians in Mexico than in Can/Aus combined! That must be why Don wants Mexicans to lose. In fact Mexico is 96% and USA is only 83% where Can/Aus are at 65ish%. Figures don’t lie, unless they do, just like the election was true if he won, and rigged if he lost. Then he lost, and won. Alt-Rite Baby! I’d say that the SS is such a small percentage plus the fact that GM and Ford will no longer produce cars there soon is more of a reason… Why go after Australia over something that’s coming to an end. As far as Canada goes investment there isnt increasing like Mexico, GM and Ford have both shut down a number of plants within the last 8 years. Mostly due to at par money at the time and ridiculous hydro rates. Canada has a huge amount of natural resources, oil and timber are two of them. Canada also used tax payers money to help bail out GM and Chrysler. These company’s are global players, the Mexico thing was just getting a little out of hand. Big difference. Mexico is sucking higher paying, more long-term jobs out of the U.S. at a faster rate and on a bigger scale. Someone’s big socialist wealth redistribution master strategy just hit the brakes. President-elect Trump is already having an effect with Ford keeping Lincoln production in the U.S. instead of moving it to Mexico; GM and Ford truck production moving back; and Ford just annoying it is scrapping plans to build a large plant in Mexico and instead build it in one of the economically depressed American towns. More jobs for Americans, investment and profits stay in the U.S. Thank you, President-elect Trump. The Chevy SS is miniscule and basically a niche car. The others aren’t huge numbers compared to what we will see soon in the U.S. The man rose to fame and vast riches by surrounding himself with celebrities and pretending to be above us all. Now he’s claimin to be a man of the people, miffed at the system that’s enriched him, pointin fingers at those that look different, while plottin from his towers, surrounding himself with those that enslave us. Really? Where do you here this from Hilary Clinton and her Democratic paid news? You can say what you like but I see a method to the madness here. Think it does not work. Just look to Ford and Mark Fields announcing Ford is canceling the 1.6 Billion dollar plant in Mexico and investing $700 million in the Flatrock plant for the additional production. Like Trump or not he has gotten businesses to make better deals than what we would have had with out his crazy tweets. I deal often with NYC people and how they do business. They will tell you FU before hello just to set the tone and not intend it to be rude but to send a message. They do business differently than most other parts. I see this in Trump and it may be a good thing over the last so many presidents that could not run a wh0re house on a aircraft carrier. Will this all continue to work. I am not sure as it will not be easy no matter how it is done. But to this point the system is shook up and I am seeing a man do more before he take the oath than after. Lets face it the Republicans and Democrats both needed a wake up call and the system needed shook up. We may not like everything that is going to be done but in the end I expect we may be in much better shape and the political parties may be more in tuned to the needs of everyone not just special interest groups. I do know we could not keep going the way were voting the treasury and they were spending us out. Even with 8 years it is impossible to fix all that is wrong so I hope the parties learn from this humble pie. what kind of business are you in where people “will tell you FU before hello just to set the tone”? are you in the illegal drug business? drug runner perhaps? If you dealt with people from NYC you would understand. We deal with automotive related warranty issues. They mean nothing offensive by it as they just want to set the tone. It is an attitude. You have to be around it to understand. I live in an area if you had the NYC attitude they would be offended but NYC and many east coast areas it is not a place for sensitive people. It is just the culture and it is hard nosed and tough. Some one named Vinny “Eh Y0 you know wada I mean! ” Is not just a stereo type it is a real way people interact and just part of their culture. If I needed a real tough deal brokered I would love to have someone from NYC represent me. You have to realize not all people play soft ball in business even corporate business. The drug dealers are just in the movies. In the real world there are some very frank and tough deal brokers out there. Decorum comes second to control. That is flat false. The new Mexican plant (planned) production didn’t get shifted to Flat Rock. – The $1.6 billion for Mexico was for small, gas-powered autos (think Ford Focus). As we know, sales of small cars have tanked. Thus Ford no longer needs the capacity. So why would they build a new plant? – The $700 million is for much more pricey electric and hybrid vehicles (which as we know are more expensive to produce, it is more feasible to make them in the U.S.). It is a completely different type of vehicle than was going to Mexico. The Flat Rock plant had capacity, in part, b/c Fusion production was moved from Flat Rock back to…Mexico. I can understand when non-car sites don’t understand that production schedules and how the industry works, but commenters shouldn’t fall for it on this site. Now it can not be proved or not proven that Trump changed this or not but odds are it was in play in their decision. Public perception true or false is always a consideration. Rob here is what Mark Fields had to say on CNN about his decision. Note it is a direct quote to Poppy Harlow. Ford (F) CEO Mark Fields said the investment is a “vote of confidence” in the pro-business environment being created by Donald Trump. However, he stressed Ford did not do any sort of special deal with the president-elect. That may be true. No need to build a plant for cars that are not needed. But once built you could move crossover production. Companies make decision for what they see is going to happens 3 -5 years out. If trump comes through with lowering regulations and cut corparate taxes it makes sense to keep production here. For those who don’t know many of these regulations are put on the books to create law firm jobs. Every enviromental impact statement, regulatory paperwork creates law firm jobs. My wife works at a big NYC law firm. Most people are professionally liberals because it helps them stay employed. He is a Puppet ! Excellent news – GM need to build where it sells. Sadly there is no chance of such wise words ever coming out of the mouth of a British establishment politician, regardless of whether they wear a Conservative, New Labour or UKIP rosette. correct me if i’m wrong, but isn’t the uk one of the biggest exporters of automobiles to the rest of europe? so land rover/jaguar … are they going to open a factory in the united states? You do know that Land Rover and Jaguar are British in name only right. Thanks to the British gov and their almost universal anti-buisness policies (nevermind the EU) both companies were sold to the Indians. Tata as a matter of fact. the point andy thompson was making is you should build where you sell. i don’t care who owns the company. america is probably one of jlr’s top two markets. so we should get a factory right? Andy, are you willing to shell out 20% more for the exact same vehicle if it is built in the USA? Because that is what USA labor rates will do to the pricing. Consumers around the world are(and most Americans – when the time comes to put their money where their mouth is) will not pay 20% more just because the vehicle was “built in the USA”. Companies today need to think globally; heck even Trump manufactures his products in China due to labor costs. My advise to Trump is he had better relocate ALL the factories for ALL the products he sells in the US before he goes attacking other manufacturers. For large volume vehicles like trucks and some SUV’s, sure. But for smaller volume vehicles (like hatchbacks) that don’t sell high numbers in the US, it won’t make sense for manufacturers to spend hundreds of millions to increase production capability in a US plant for the small number of those cars sold in the US and then expect the rest of the world to pay 20% more just because it was built in America. No, GM, Ford, etc will just pull that model out of US sales and it won’t be available to US buyers. If the cost to move to the US is not offset by significant profits, they will just pull the model off the US market and work at selling these extra vehicles in other global markets. If Trump wants to create jobs in the USA, tax any product made by a manufacturer whose global head office isn’t in the US. That would have head offices (and tons of new jobs) being created all over the US. But what he is doing is forcing what were originally American made companies into an unfair price position with these border taxes when compared to imports like Toyota who built factories here to save freight costs on their highest volume sellers (just like Buick in China). Japan and Korea have subsidized their manufacturers in setting up factories here (because most of the net profits are sent back to their respective homelands to be spent there on R&D, etc). JLR have thrived in spite of and most assuredly not because of the British government. The New Labour government refused to help JLR at the time of the 2008-9 crash – yet it spent £1.3 trillion (yes, trillion) bailing out Britain’s greedy, immoral banks. JLR is now building plants in India and China precisely because to sell in those markets they need local production to avoid tariffs that would make even premium products non-competitive. Let us never forget that Japan, then Korea and now China built their automotive muscle behind tariff walls. The main reason Honda, Toyota and Nissan invested in the UK in the eighties was because they feared import restrictions. Now there is no longer that fear, have Hyundai and Kia followed in their wheel tracks? Of course not. They make where they have to and export from those bases to places which don’t care where things are made. Or in the case of the British government, which buys its navy ships from Korea, its army uniforms from China and its military trucks from Austria, doesn’t care as long as the stuff is most assuredly NOT made in Britain. If you voted for him or not is beside the point.. You can agree with me or disagree with me but NAFTA needs to go. I love GM since I was a kid, the trucks I have been a long time supporter but building vehicles in China to be brought here like the Buick Envision, I don’t think that is fair for the American people. It’s sad today that almost 25% of Detroit is unemployed. I don’t care if someone is democratic or republican, I see all these companies going overseas and to Mexico and it’s only hurting us and our Economy.. and it’s not just GM it’s Ford and a more companies.. there was pride when something was made in America. I’m not against imported vehicles as a whole, but when the job can be done here why not? As one poster previously said, ‘ Are Americans willing to pay an extra 20%+ for an item just to say it is built in America? The potential is that if the US government is putting sanctions and tariffs on imported goods what is to stop other countries from doing the same to American produced products. Other than China, the USA is the 2nd largest next exporter in the world. The US has more to lose in a war of sanctions and tariffs. I understand the taxes but it’s really unfair for business, if our import tax is lower than our export tax, something is not right.. I know the whole arguement and that’s why I was agreeing with the president elect with the export tax.. it’s hurting business.. I was referring to made in America because when you use to buy something it was confidence in it. My argument was and is with trade and taxing our companies off the wall.. I don’t understand why he hasn’t gone after the Envision yet. I’m all for build where you sell but if you are going to build outside the U.S. I think Mexico is the best place because it will strengthen the Mexican economy which is a plus for the U.S., I am more offended with the Chinese Envision ,GM is obligated to build as much as it can here and the reason is … BAILOUT. Its own country saved it from death and how does it show its gratitude? It invests in other countries and that is not right. Also he is going after GM now because Ford just announced that it is canceling its plan for the Mexican factory. Anti-Trump people will say that he had no influence on this move however while he might not be totally responsible for all of it, if Trump had not called Ford out it would not have been as covered in media as it has. And thanks for not being an apologist. Worst part is that the Envision is not even a cheap SUV. We import millions of vehicles from Mexico every year. Most of those vehicles are produced by mega factories owned by Japan and German based auto manufacturers. These import brands may face much more serious problems than GM and Ford. These tweets are a victory for U.S. based auto manufacturers. Death by tweet, may soon be an issue for the import based brands, still importing from their home Countries. Donald Trump retail products (ties, watches, etc.) that are made in China should have the same tax imposed on them as well. this simplistic “build where you sell” is ridiculous. so every country where a car is being sold will have a factory to build that car? what the tires? what about the other thousand components? NAFTA was a good idea when Clinton signed it into law , our economy was doing very well . But things have changed and it’s time to tweak it or change some of the rules in the treaty . Whether you like Trump or not it seems he is to a point keeping his campaign promise of putting CEO’s on notice that making products in another country and selling here is not going to be tolerated anymore . America first . We should all want this man to succeed because he will be President and he has the means to make this country better or not . All of our lives will be effected by the decisions he makes . We have already seen that his tweets can effect the stock market when he has siad something about a company . The truth is that we will never get back all of the manufacturing jobs we have lost but hopefully there is going to be a man in the Oval Office that can slow down the drain of jobs going out of our country . Lowering the tax rate on companies may make CEO’s decide to open factories here and put our people to work . 2. USA union labor rates and contract demands. How many people had/have no post secondary education and are/were making $50-80,000 a year with full benefits, pension, plus layoff pay when demand for product was slow? Heck, many professionals like nurses spend thousands to get a degree and have trouble making that. People in dangerous jobs like police and military have trouble making that and they lay their lives on the line every day. But hey, the factory worker uses an air or electric powered tool to put the same piece (lifted and positioned with mechanical aid – don’t even have to lift it themselves anymore) onto vehicles every day but get paid and looked after better; many with no education. What is wrong with that equation? You’re right but I’ll answer this question sideways and broader: what’s wrong with this equation is that a jobs based economy no longer works locally or globally. It’s in a death spiral and I for one want it dead ASAP. rump wants bring jobs ‘back’. As Obama said some years ago, ‘Those jobs are gone’. And more are going. Why? Because it’s how the rich have set up the system. The only way those jobs will come back is if American workers give up almost all rights, minimum wage, and learn to live with it. When rump said he wanted Apple to build iPhones domestically, Foxconn (the people that make them via slave factories in Asia) offered the solution of robotics. Have robots build iPhones domestically. After all, that is what’s going to happen in Asia. The process is already beginning to remove most workers in China. It was said that rump wouldn’t be fond of that idea. Robots aren’t voters. Do you see the problem yet? If you don’t — have you noticed during the last decades that our populations keep growing but computers have been eliminating jobs at the same time? Add robotics into computing and there will simply not be enough jobs for everyone. We’re already there but it’s about to become real obvious. 3. Get everyone properly fed and housed to accomplish #2. 4. Reduce and eventually eliminate war and terrorism by accomplishing #3. And that’s it. It’s not hard. It of course would be hard in a current delusional point of view that JOBS matter first. JOBS got us in this predicament. Car manufacturing made oil the king of planet killers. We — the human race — are supposed to be the priority. We as a population can accomplish a great deal if we work to make EVERYONE fed sheltered safe and happy. As long people still have the sense of entitlement they have today, this issue will never get fixed. I have worked my bag off to get to where I am and I can now enjoy the hobbies I like to do like snowmobiling and fishing. I still live in a 30 yr old 1000sqft house and don’t have a lot of newer things others have. But I have a very nice garage and enjoy my hobbies. My wife and I live comfortably but I won’t be retiring at 55 either. The problem is that people think they are entitled to having the same without having to put the years of hard work in to EARN it. How many people sit at home wanting the perfect job because they think they are entitled to it versus how many realize they have to start at the bottom and work hard to get that perfect job? Too many today want the first. Here lies the dilemma: (first of all, let me say I realize there are truly homeless and less fortunate due to circumstances they can’t control). As someone who has earned it, should I be willing to either take less pay (so it can be spread around to create more jobs) or give up my hobbies and perks I’ve earned so that money can be given to someone who isn’t working or used to create a job for someone else? (just responding to your “everyone fed, sheltered, safe and happy”). Too many people want these things without putting in the effort and just expect it to happen. The sense of entitlement has also led to people demanding more than they need (overconsumption of goods they don’t need). They are “entitled” to the best of the best and go deep into debt to get it. Then they demand higher paying jobs or pay raises because they are “entitled” to it (so they can afford the crap they don’t need). I agree on the robotics part. Technological advances are not always in the best interest of the human race. The food and housing for everyone? Who is paying for the Education for everyone? How do you control population? Forced Sterilization? Forced Abortions? Make it illegal to reproduce? You can provide all the things you list and still some nut in N Korea with next to nothing but a bomb will take you out. Jobs and Economy is what prevents most people from rising up. Why do you think we have welfare. The intent was to keep the masses from rising up as this is usually the flash point for most societies. It is not easy and it takes work. There is no utopia out there that we all live in in harmony and peace with nothing else. Sin and greed has taken that easy away as no matter how Fed, safe people are and happy they always want more. I am not sure what professor got a hold of you but he fed you well and made you feel safe but he used a big lie to get you there. The fact is Radical Islam is out to kill anyone who is not with them. Jobs mean nothing, money means nothing killing the infidel is it all. It matters little if you are Jew, Christian, Buddhist or even Islamic as if you do not follow their religion law they will see you are put to death. They believe that it is their mission from God to kill anyone not with them. They are a small part of Islam and they will even kill those of other branches of Islam. Do you really think they are worried about food or Education of any constructive kind. They are small in number, they do not represent all Islamic but like Cancer they can kill an entire body. Putin do you think he is worried about being fed and being safe? How about Kim Jung Un. He appears to be safe as he kills anyone who opposes him. He also look a little on the hefty side compared to the people of his country he is starving for nukes. How about the radical leaders of Iran. They are willing to kill anyone opposed to their religion in their country so do you think they really care about food and being safe? I can see insane in their actions and in the way you think. Nothing personal but you really need to so some real study on the real world. You must live on the west coast some where with that kind of thinking. What you did is take the end of what I was saying without refuting the opening. Which is a pointless discussion. And the lazy route. Foxconn told Trump to resort to robotics to bring iPhone manufacturing back to America. Not jobs, since Foxconn (and Apple) are eliminating those jobs in Asia so that the factories can be run with much smaller numbers. What you were supposed to hear that time (and this) was how big business thinks. Two words: screw people. I don’t blame business for thinking this way because corporations are heartless beasts. Again: corporations (oil and car) are literally killing us off right now with our apologist defense of their right to do so. ‘To create jobs!’ But you just heard one of the world’s most profitable corporations unapologetic about eliminating jobs to feed robots. The irony being this beast of a corporation was created by a man named Jobs. So before an even remotely coherent conversation on this topic can begin you must agree with the simple premise that more people + more computers + automation and robotics = less jobs. If you can’t grant that you’re living in LA-LA-Land. You must also be willing to grant that global warming exists and man is generously contributing to it via cow and car farts. To disagree with such is your unethical prerogative but unfortunately a non-scientific conclusion. And scientists know way more about this than know-it-all blowhards. So once we grant that the planet is in peril and that jobs are dwindling everywhere thanks to tech and growing populations — you can more appropriate respond to and address my point. I want the current system to collapse. So that the word ‘pay’ would become replaced by ‘provide’. The answer is along the lines of barter. How does a teacher eat? By teaching. How does a farm worker get their kid an education? By farming. How do both get healthcare? By teaching and working the fields, respectively. And this is how the doctor’s kids get food and educated. Now I know that is a simplistic answer. But that’s the basic idea. It doesn’t address the freedom of property acquisition. Meaning some people are happy with a little condo on a nowhere street where others desire a nice big home on beach property. There is a way to address that within barter but I don’t want to change the subject yet. Man. Talk about robotics. If I had a dollar for every time I heard this preprogrammed automated message I’d own two Cadillacs. The ‘tell’ here is that you had to go very extreme to make your point. How did we control cigarette smoking in America? Forced jail time for smoking? Forced patches or you got a scarlet letter tattooed on your forehead? Nope. Nothing so extreme. We took simple small measures which dramatically changed things over time. I remember when you could smoke in bars, restaurants, and frickin’ planes. FRICKIN PLANES!!! But people started to understand that maybe just maybe it’s a little stupid to make other people suffer through your bad habit. Not to mention it modeled that habit as desirable. Population control, first of all, is going to happen thanks to global warming. As water gets harder and harder to find people will begin dying. When that hits the fans you’ll see parents triple think about having children. But the cigarette thing teaches us methods of reducing population easily. Free healthcare for parents and their first child. A second child? That’s gonna cost you. A third one? WOW. So the super rich and privileged will have as many kids as they want — and provide through the eyeballs to do so. Advanced education? Your first kid free. Second? Expensive. Three kids? REALLY expensive. The point of getting our act together is to inspire other nations to do the same. The irony here is that our economic model (which we thought was so awesome) inspired other countries to copy us but beat us at our own game. They took freedom from their citizens to beat us and — guess what — they did! This is why Obama said those jobs are gone. They are. The only way we can compete back is going even lower. Taking more rights from ourselves to beat them. But then they’ll just go lower too. This is why I said (and say) this system is DOA. You can parrot back the “it may not be perfect but it’s the best system yet” but horseshinola I say. A bunch of Midwest types know that something is terribly wrong. And it’s what I’m saying. The system no longer works because foreigners are beating us at our own game. And as you point out all the time people like cheaper prices. That is you admit the system if fornicated. Bring jobs ‘back’ can’t work until pay drops through the floor and prices with it. Since neither will happen it’s the very stuff of Fantasy Island to think otherwise. And those sad sack MidWesterners are going to get so much more butthurt than they ever dreamed by electing a tool that proudly poops on a golden throne. Yeah — rump really cares about the common man. The more you post the more you make my point. Barter LOl! I could say your nuts in my opinion but you remove all creditable doubt with each post. Because you’re narrow minded you lack the ability to recognize that barter is a currency. So is time. And you still are unable to admit the current system is collapsing — which has nothing to do with Obama or rump. Pleasing investors has nothing to do with making Americans happy. That’s why all our jobs are leaving. That’s why more and more jobs will be replaced by computers and robots. Why does business want self-driving cars? You’re a fool if you think it’s for safety. It’s so that trucking and Uber and Amazon will no longer need drivers. The money that would come as a result … How is that going to improve things? Where’s the money go? That’s what I was asking. Beyond a penalty where the $ just goes into the ether. I believe what we are seeing here is just threats to bring a common understanding. Trump is dealing with many of these companies like the unions deal with them and make threats for 150% of what he would like to see and then work out a deal acceptable to both sides. He has enough business smarts to know some things can not or will not change but he also knows companies can change things that they can do with little detriment to their bottom line. He will try to take the climate in this country to make it more appealing to do business in and to bring the money made overseas back. Many of these policies will not work over night with all the damage that has been done but over time they do come into play. Many think that the Clinton’s alone did all the positive economic growth but much of it came from what was started in 1980. With the up turn in an economy it can take years to get it right and overnight to kill it. As for the money. I am not sure it will ever have to be accesses if agreements are made to make a better effort to create jobs. If there is money accesses it will go into the general fund and could be used for many things from fixing SS to paying the debt or even create jobs replacing old bridges. We have seen Trump call companies to task over their charges. I can see him calling the Senate and House to task even being republican over proper spending and cutting down or deficit spending. He will do his part to bring business back and create jobs so more taxes can be collected from a thriving economy and they will be held to do a better job spending and cutting waste. I can not predict the future but this is what I speculate we may see. It for sure will not be business as usual for Democrats or even Republicans. Anyone who does not cooperate will be called to public attention in a tweet and will be left to answer for their actions. People are elected to represent the people and of late they go to DC and represent themselves. I see Trump calling anyone out that is not trying to make things better or right for the country as a whole. It could get ugly as taking away the easy lobby money will not be smooth as they will take the money and try to attack him any way they can. We already see it on the left with their attacks even after the election was resolved. Everyone on the left thinks all the lobby money is on the right but we are seeing big spending on the left to attack at all points. It will only get worse and we may even see some from the right do the same. There is a disconnect in logic from #1&2 to #3 and to #4. Nice John. The world needs a lot more of you. A lot less filthy rich dudes driving domestic and foreign policy 140 characters at a time, if you ask me. Trump needs to realize his import tariff will spark retaliation with China and Mexico. Those 2 countries just might cut off all relationships with the USA if the tariff idea goes thru. Plus consumers would be stuck paying $1000s extra for cars because the tariff will just be passed to the consumer. Tom China needs us as much as we need them. In fact they need us more. First we owe them so much money they need us to remain solvent to pay them. If not they default and their already fragile economy will fail. Mexico the only thing we have to fear there is their government fails and goes Cuba on us. The real issue is the cost of products to the American consumers that could slow the economy. They need to use care in what and how they approach things and I expect if they get some of the jobs they will be happy. This is called the art of the deal and right now we are getting nothing and if we can slow or bring back some that is a step in the right direction. We have to get the economy growth back to 5% in real economic terms not what we have been getting. 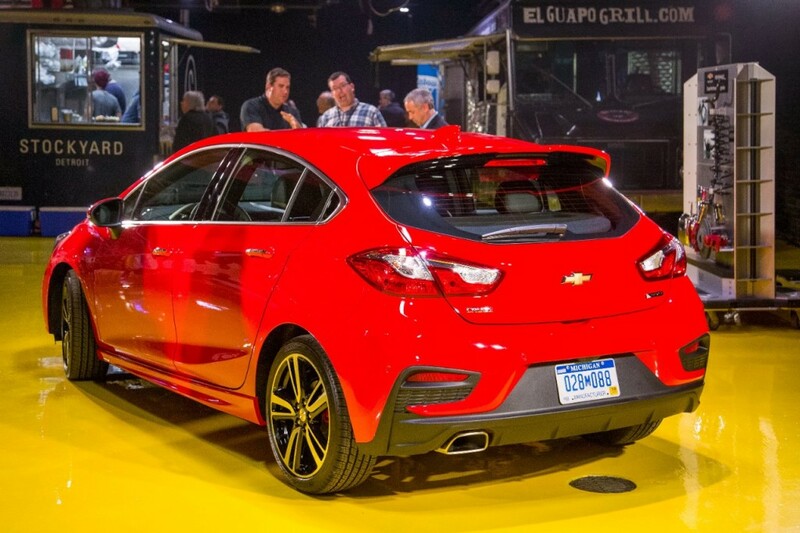 I do not see the Cruze hatch production coming here nor do I expect they feel it will either. But doing this may prevent something else from leaving or GM making a better effort to keep here what they can. Other wise they will move more there. I think people trying to honestly save on car costs don’t buy new. I know a guy that buys a near scrap value vehicle every year, uses it a while, makes a minor repair or two, and more often than not sells it for more than he paid. The idea to encourage more employment here is that those people also spend. The money velocity matters. I fairly recently bought a last gen Cruze and If there was a Lordstown made hatch then, I would have got one. It’s the nearest assembly plant. It fit my needs at the time, and it was a very fair deal. I have my loyalties. Scaling back relations with Mexico and the PRC Middle Kingdom doesn’t bother me one bit. When I was in high school (l–o–n–g ago) we used to have desks with inkwells in them so that you could refill your fountain pen. Our principal would spend most of his day filling any empty inkwells he saw. Something about forests and trees? I am not sure that all of these Tweets are part of some coherent, synchronized plan to heighten awareness rather than someone filling inkwells because they may not be able to control the high school? Trump flunked his geography classes. “American” means ANYTHING made in the Americas, which includes the entire western hemisphere and both continents, North and South America. Mexico is “American” and so is Canada. What he wrongfully calls “American” is the collection of the States. That is why the official name of our nation is “The United States of America'”. or the union of fifty states in the American hemisphere. So if Ford and GM have assembly plants outside of those fifty states but in the same American hemisphere, it is all “American”. And their plants outside of this continent (such as in China, South Korea, and Europe) and also defined as “American” because they belong to a local brand and that brand gets the income of each sale. The Cadillac made in China is “American” as the Chevy made in South Korea because the income from each sale returns to GM. The nationality of the product is the owner of the brand, not where it is assembled. And by this same definition, all the Toyotas, and Hondas assembled in the U.s. are Japanese, and that is where the money is going. If Trumps wants to help the U.S. economy, he should impose a tariff on ALL the foreign brands that assemble and sell in the U.S.
To further convince anyone who reads this, the “discovery” of “America” was by an Italian who was funded by Spain. Over fifty percent of the continental territory belonged to Spain. Most States still retain their Spanish names, The “America” name came by a mapmaker who wrongfully used the Italian Americo Vespucci as the discoverer. If he did it correctly, the name will be “Columbia”. So, how does “The United States of Columbia” sound?